the price quoted in most of the websites (5.96lacs) is applicable to only delhi after subsidy of more than 1.5 lacs from state govt..please note no other state is providing this.. In other cities the on road price for T0 is 8.5 and T1 model is 8.95lacs (except bangalore)... most of the websites (some of them might be paid) praises the car.. but the reality is that it is not worth more than 4 to 5 lacs.. there is nothing great about this..M&M have done just arranged a big body for the old reva and they say the E2O is technically far from old reva-i... who cares..when the basic purpose itself is not served... if you arrange the solar panel at home for 1.5 lacs (mentioned by mahindra )..then the price is more than 10 lacs and one can happily buy an XUV500... entering into the rear seat is definitely a tough job...a medium built person finds it difficult.. the worst part is that the break and accelerator are very closely packed with no space on either side and hardly any space between them.. it is possible that you press accelerator instead of breaks... it doesn't need great engineering but just common sense.. mahindra reva boasts of fuel savings.. does it mention the limitations? 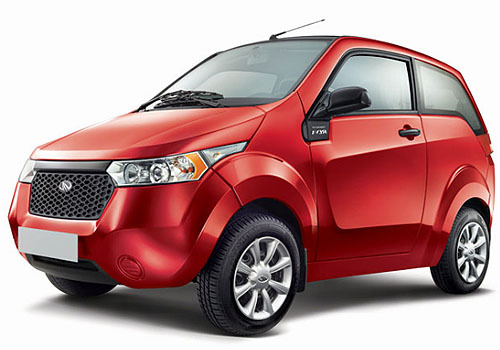 the range is very less..less than 100km..if you are in a heavu traffice with A/C on..you get max of 70km.. tha battery life according to mahindra is 5yrs..what if it gets damaged in an year..it costs you 1.5lacs..